Olive oil has many cosmetic uses, like castor oil, and can be used for total body wellness. It’s great for consuming or for applying on skin, etc. Which oil is best for your needs? Let’s examine the differences and similarities between castor oil and olive oil to see why we recommend you keep a bottle of olive oil in your bathroom right next to your bottle of castor oil. Olive oil is one of the oldest known foods, with origins that date back to 3000 B.C. The mighty olive was a source of food, fuel, and medicine for the ancients in the regions known as present-day Crete and Syria. 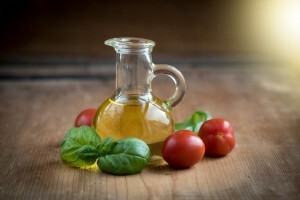 Olive oil boasts an extensive list of health benefits, and is the prized feature of the Mediterranean Diet, a heart-healthy diet that has earned much acclaim around the world. When consumed as a food, olive oil has an array of health benefits, from preventing certain diseases to treating inflammation. Olive oil can be applied externally to moisturize and treat dry skin, to polish shoes and household surfaces (including stainless steel and wood), and it can even be used to create biodiesel fuel. Cosmetically, olive oil can be used to whiten teeth and remove makeup without the harsh, drying chemicals found in commercial tooth-whitening products or makeup removers. The Mediterranean countries of Greece, Italy, and Spain consume up to two-thirds of all olive oil that is produced worldwide, and the Mediterranean region is also known for having lower rates of cardiovascular disease and certain cancers. It is believed that the health benefits of olive oil are strongly linked to the health of the population in this area of the world. So how do castor oil and olive oil stack up? Olive oil and castor oil provide a lot of the same health benefits. Your unique needs might mean that one oil will work better for you than the other. When it comes down to it, which oil is the better option for you? We know by now that castor oil has a great reputation for thickening and regrowing hair. It turns out, so does olive oil! Olive oil can help remove the buildup of sebum–which is what prevents the growth of new hair follicles. Olive oil is also rich in vitamins A and E, as well as antioxidants, which helps protect hair and seal in moisture. It can be used as a conditioner and you can even smooth a small amount of it over fly-away hairs when styling. It is those same vitamins that make olive oil great for skin as well. Olive oil can moisturize, exfoliate, and improve elasticity of skin. It can also be used to gently and naturally remove eye makeup without the harsh chemicals typically found in over-the-counter eye makeup removers. Beware, olive oil can leave a greasy residue. Castor oil is a diverse oil but is great for external use. On the contrary, olive oil’s list of internal benefits is quite long. Castor oil can treat gastrointestinal distress, can lengthen and strengthen hair, and can act as an antibacterial and antifungal for a multitude of skin issues. But, olive oil works well to prevent and help with certain cancers, to polish household surfaces, and of course, in cuisine. Both oils have so many benefits, but olive oil has a little bit more character and a little bit wider of a reach. Neither castor oil nor olive oil has a particularly satisfying smell. Although the scent of olive oil is much more mild than castor oil, which some people find to have an offensive smell. The good news is, adding aromatic essential oils is always an option to improve the scent of any oil. Try adding lavender to castor oil, or lemon to olive oil. Olive oil is available at a variety of price points. Olive oil, or commonly extra virgin olive oil (EVOO), virgin olive oil, refined olive oil, or pure olive oil. Experts recommend cold-pressed EVOO for its purity and nutrient density. Olive oil can also spoil when exposed to light and heat, and the dark bottles help protect from oxidation. Always store your olive oil in a cool, dark place. You can expect to pay anywhere from $13 USD all the way up to $30 USD for a quality bottle of cold-pressed EVOO–sometimes even more. There is quite a bit of controversy surrounding the grading of olive oils in the U.S., so making sure you are getting the most bang for your buck can be a time-consuming endeavor. Castor oil, on the other hand, seems a little bit more straightforward. NOW Solutions brand 100% pure castor oil rings up at just under $9.50 USD for a 16 ounce bottle on Amazon, making it the cheaper option–and requiring much less research on the part of the consumer. If you wish to really find the best castor oil on the market, check out our complete guide. Hair efficiency 90/100 95/100 This is a close one! Olive oil is great for hair, but castor oil has the better reputation for thickening and lengthening your locks. Skin efficiency 85/100 90/100 Both castor oil and olive oil moisturize and exfoliate skin, however, castor oil is better known for its antibacterial and antifungal properties, giving it a slight lead in the area of skin efficiency. General efficiency 90/100 85/100 Both oils are excellent in terms of cosmetic use. Olive oil gets the slight lead because its internal benefits are on par with its external benefits. Texture 80/100 75/100 The texture of olive oil is nicer, but very greasy. Castor oil is known for its thick texture, which some find unpleasant. Odor 80/100 70/100 Olive oil wins this round as some people find the odor of castor oil offensive. The scent of both oils can be improved by the addition of essential oils, like lavender. Easy to apply 85/100 75/100 Olive oil goes on smoother and is easier to apply. It is less viscous than castor oil, though it can be quite greasy. Average price 65/100 90/100 Olive oil prices range from low to high dependent on quality, and the best oils can be quite costly. Castor oil’s pricing system is more straightforward and it is also the cheaper option. RESULT 82.1 82.8 By a very slim margin, castor oil wins! The oil cleansing method has gained some momentum in recent years. If you suffer from acne or oily/combination skin, ditching your harsh chemical cleansers for this natural approach might help your skin recover and improve. Mix two drops of castor oil with about a teaspoon of EVOO. Gently rub the oil mixture into your skin with slow circular motions, and then apply a warm washcloth to your face. Gently wipe away the oil and rinse your face with warm water. No need for soap or moisturizer–this concoction satisfies both needs! No need to choose between castor oil and olive oil, each of them contributing in its own way to our health, beauty and well-being. Next Post What is Hydrogenated Castor Oil ? My skin is too much dry… Which oil makes it more moisture… Olive oil or castor oil…. I might be a little biased, but castor oil really works wonders for dry skin. You could also combine both and see which recipe works better for your skin! Can i use castor oil mix with olive oil for hair growth? Hi there, yes of course you can 🙂 Follow the recipe in the castor oil and olive oil article for details! Thanks for reaching out with your question. No worries, this confused me too when I first learned about castor oil. It’s a tale as old as time, “back in the day” someone’s ma used to whip out the CO and give their kid or grandkid a spoonful of CO to help “clear out” the bowels. Well, some households may hold on to this “method of cleansing” but me personally, I really do not recommend it. Castor oil is TOO powerful to be absorbed internally, and dosing it correctly is dangerous. A drop too much and you can find yourself emptying your guts out for hours. Too much can be fatal. Castor oil packs are used for treating/healing internal pain/issues. Hi Judy, I’m not quite sure what you mean. Could you be more specific? 🙂 That’ll help me answer your question better. Thanks!